Whether you’re traveling for work or leisure, long plane rides, multiple hotel stays and varying climates can really take a toll on a person, which is why we’ve found just what you need to make it a bit more enjoyable. From carry-on cocktail kits to hydrating facial spray and everything in between, these items are what every jet-setter can’t leave the house without. When your flight is delayed, be ready with an adult beverage at a moment's notice. Even though the alcohol isn’t provided in this TSA approved cocktail kit, it has all you need to create some of your favorite signature cocktails! With many combinations available, some of the recipes include Moscow mule, old fashioned and hot toddy just to name a few. All you need to do is get a bottle of the good stuff from your friendly flight attendant and that 3 hour flight just got a bit more bearable. 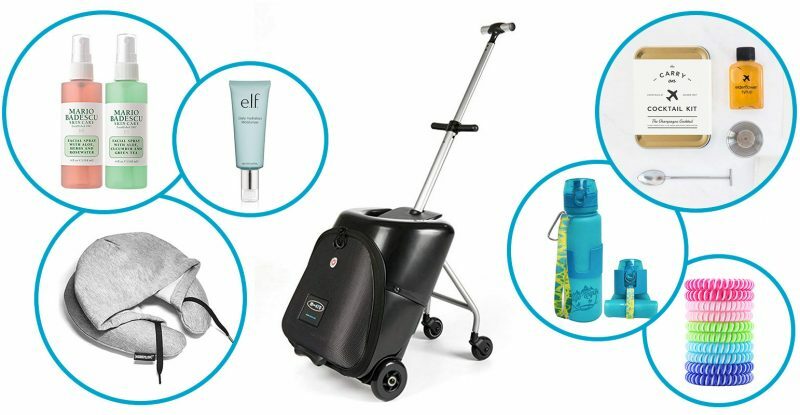 A scooter and suitcase unite in one of the best combinations since peanut butter & jelly. Those long treks across the airport just got a lot more fun…for the kids! You won’t need a stroller when you have the Micro Lazy Luggage, which is basically a stroller and suitcase all in one. Simply have your child sit in the super comfortable seat and hold on to the handles and pull them along. You always have at least one nice dinner on vacation, be sure to always look your best. When you’re traveling and your clothes are kept in a suitcase, odds are they will get wrinkly. While most hotels are happy to provide you with an iron, why not avoid the middleman and pack your own Steamfast Mini Travel Iron! With a 2-year hassle-free warranty and 3 temperature settings to accommodate various fabrics, you’d be crazy not to have this packed for every trip you take. Every shutterbug could use this device in their arsenal. It’s no secret when you travel you tend to take more pictures than you thought humanly possible, and that’s not a bad thing! But what would make them even better is this great flexible tripod that connects directly to your phone. Even more, it has a wireless remote so you don’t have to struggle with that pesky photo timer. We all get a little disorganized on the road, make finding your keys a little easier. Dude…where’s my keys? If you’ve ever found yourself muttering these words on a road trip, then stop what you’re doing and get a Tile Mate. This Bluetooth tracker is a best-seller among those who find themselves prone to losing things. Just attach the Tile Mate to your keychain, download the app and never loose your stuff again! When you can’t find an item simply activate your Tile Mate and it will start chiming up to 150 ft away. Opt for the neck pillow that keeps your head warm and hides you from the world. Travel pillow and hoodie come together in what some say is the best combination since peanut butter and jelly (okay, that was me…I said it). Either way, your airplane snoozes will be a bit more comfortable with HoodiePillow’s inflatable travel hoodie. Not only does this pillow have a hood (hence the brand HoodiePillow), but it’s lined with your favorite sweatshirt material for ultra comfort. What are you waiting for, get to napping! Some of us are minimalists, and some just like to keep things simple, this is perfect for both. Leave all that unnecessary stuff at the hotel and only take what you truly need on your next adventure: your phone, i.d. and credit card. If these are your essentials, then you need the Spigen iPhone case with hidden card storage. Available in 4 different colors and able to carry multiple cards, this is the perfect item for all you minimalist travelers. Easily stash this in your carry-on and you'll be toasting to vacation in no time. Perfect for your next camping trip, this stainless steel collapsible shot glass is durable, easy to clean and an essential to all your drinking under the stars needs. If you want the professional camera quality without the professional camera. Vacations mean picture taking, it’s a known fact. So why not give your photos some extra flare with this easily attachable iPhone camera lens. Not only does it have multiple size lenses for varying shot distance, but it’s easy to use and provides professional quality images. Don't get it twisted, keeping your cords straight just got easier. If we can agree on just one thing, it should be how annoying it is to untangle your earbud cord. So instead of just throwing it in your bag and hoping it doesn’t come out in a tangled mess, why not keep it nice and tangle-free in this convenient earbud case! Keeping multiple bags together and your hands free wasn't possible...until now. Running through the airport pulling a suitcase, carrying a bag that constantly falls off your shoulder all while struggling to check your ticket for the right gate, is hard. Why not free up your hands and keep that shoulder bag secured to the suitcase with the Travelon bag bungee! Easily attachable to the handles of your luggage, this item will let you carry more with less effort. Staying hydrated on-the-go has never been more convenient. How many times have you found yourself on a hike, you’ve finished up the last of your water and then have to carry around the bulky bottle? Well, you wouldn’t have to if you owned a collapsible travel water bottle! The Aigo Logik Silicone water bottle is lightweight, durable, doesn’t leak and rolls up for easy transport. Basically it’s the water bottle of your dreams if you’re constantly on the go. No matter where your travels take you, music always makes it better. Wherever your travels take you, music always makes it better! So why not invest in a quality-sounding, top-rated portable speaker? The question shouldn’t be why not, it should be why haven’t you already gotten one? No worries, we found the perfect one for you. The Bang & Olufsen Beoplay P2 Bluetooth Speaker is great for music on the go! Stay connected to those back home, even when you're traveling to the ends of the Earth. What is traveling if you can’t post the perfect picture because you don’t have service? Never deny your friends the jealousy that comes with your awesome travel pictures by always staying connected with a mobile hotspot. The GlocalMe Mobile Hotspot has worldwide sim free connection, a 4G LTE highspeed network and 1GB free global data you’ll be asking why you haven’t already gotten one! Rosewater is the stuff of legend, and this one has a devoted cult following. Long plane rides do a number on your skin. It can get dried out, tired looking or feel just plain grimy. That’s why you simply can’t leave these Mario Badescu Facial Sprays off your packing list. These cooling facial mists hydrate and tone your skin so you can walk out of the airport looking refreshed! The perfect on-the-go beauty essential to keep your skin happy even while you're on the road. Traveling takes a toll on your skin. From varying climates to different elevations, this all impacts your skin in one way or another, and it’s important to make sure your skin is hydrated. Which is why e.l.f brand daily hydration moisturizer is the perfect on-the-go beauty essential to keep your skin in tip top shape no matter where your travels take you. Falling asleep on a plane can be hard, this will make it sooo much easier. On any plane ride that is over 2 hours long, you probably want to pass some of the time with a nap. Unfortunately, it’s not always that easy. Not only is this cotton sleep eye mask made of comfy material, it effectively blocks out any light, is adjustable and your eyes feel free! You’ll be asleep in no time on your next flight. Avoid those pesky bugs and have a cute new bracelet? Sign me up! It’s always great to get outside, explore nature and take in all the sites the world has to offer. Some of those amazing places, however, can keep you from enjoying them because of one thing, mosquitoes. Which is why you need mosquito repellent bracelets that are not only easy on the eyes, but also easy on the smell, while effectively keeping those pesky bugs at bay. Sometimes you need an energy boost, but want to skip the coffee breath. Be minty fresh always. Traveling is exhausting, and sometimes you need an extra boost to get over the jet-lag you experience after a cross country flight. Turn your attention to Run Gum Mint Energy Gum. With the same power of 1 cup of coffee or energy drink, this sugar free, zero calorie gum will not only leave you with the energy you need, but also keep your breath minty fresh! We're all guilty of over-packing on vacation, this will help keep you organized. It’s easy to get disorganized while traveling. You just throw everything you need into a bag, but then have to dig through it to find the one charger that ended up at the bottom of your suitcase. Why not make it easier and have a designated place for everything with this convenient roll up travel organizer, specifically made to hold all the chargers, earphones, and other small electronics you need when traveling. While it's always nice to share, you'll want to keep this coloring book all to yourself. As much as we would love all of our travel plans to go as smoothly as possible, that just isn’t always the case. Traveling can be a bit stressful, so why not unwind and get in touch with your creative side with this stress relieving adult coloring book! With 50 animal patterns to choose from you will have hours of stress relief to get you through that next family vacation.